DRAFT ANALYSIS: "Tall defender with good athleticism and pace." Riley Grundy is a tall defender who has been on a fast trajectory the past few years having moved from a basketball background. He is brother of Collingwood’s Brodie Grundy, and despite not being quite as tall, possess greater athleticism. Grundy has been settled as a key defender for Sturt’s Under 18 side, then also playing in a similar position for Sturt Reserves this year. Grundy’s progression has been impressive as his size, athleticism and ability to mark and close opponents make him an interesting player. He is a raw talent, who has come late to football, but in his roles down back have highlighted his ability to intercept mark and play very tall. 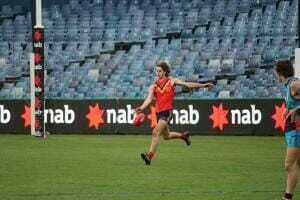 At times for Sturt Under 18 he had pinch hit in the ruck as well, showing his versatility. Grundy impressed in 2017 at the SA combine and in 2018 was rewarded with a selection in the SA’s 2018 National Championship winning team. He was played solely as a defender in the Championships often against the number one forwards. Grundy has shown in a short space of time what he is capable of behind the footy and that he can hold down a key defensive post. His athleticism and speed enable his development to be rapid and for his size can outrun and out-leap his opponents. His strong hands and leap make contested marking a feature and also his ability to spoil against taller opponents. There has been a steep improvement in his kicking skills and ground ball work over 2018. Grundy’s excellent speed and athleticism allow him to close in on contests and make life very difficult for his opponent. He would often out-mark his opponent in a contested situation and as the season went on showed his improvement in reading the play and taking intercept marks. His vertical leap is top-end and no doubt his recent performances at the National Combine highlight his athletic abilities. While Grundy’s possession count was relatively low in all his games for Sturt and in the National Championships, it is reflective of the position he was required to play as a key defender. When the opportunity arose for him in certain games, he showed he could break lines and rebound from the back 50, and his kicking has certainly improved and would often hit his targets. Given the freedom in a game to play off his opponent, in certain games was clearly the best mark on the ground. He may have the possibility to turn into a second string ruckman, but his size may play against him for this role at the next level. Grundy is a late comer to football but has shown a tremendous ability to learn the game and play his role. He can continue to improve in his ability to read the game and have a greater impact on games as a key rebounding defender, which is where he can progress. There is no doubt there is raw talent with Grundy and in a AFL environment could make his development even more rapid. He is a very good kick, but sometimes under pressure can turn the ball over, but with some more development his technique is sound and he generally makes the right decisions. Grundy does however not find heaps of the football, for a player with athletic traits, he averaged 5.3 disposals at the National Under 18 Championships, something an AFL club will look to increase given he has the ability to hurt opposition teams offensively. Riley Grundy personifies raw talent in the draft pool. He has tremendous athleticism and huge upside as shown by his quick development in the past 18 months. His hands are strong and naturally a defender in the way he plays which at his size and speed make him a valuable commodity. Given his work ethic to date and how dedicated he is to improving are good signs of his mental toughness to get to the highest level. He is a player that has come under the microscope given brother Brodie’s remarkable season, and clubs will consider if he can have a similar rise, as he has already done in his top-age year.